If you have trouble optimizing operating income because of leaks in your revenue cycle, it might be time to invest in some outside help. Revenue cycle management solutions like Health iPASS can come alongside your practice and help guide you to increased operating income, greater price transparency, and elevated levels of patient trust and patient retention. In addition, automating processes that had previously been done manually reduces human error and frees up your team to concentrate on their core competency - better serving patients. When on a difficult journey, sometimes a total course correction is the key to getting you to your intended destination. 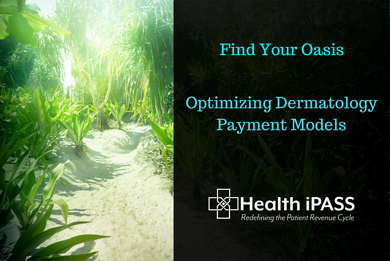 According to a recent Dermatology Times article, many dermatology practices are transitioning to direct-pay models rather than continuing to grapple with the many challenges of contracting with private insurance companies. In a direct-pay model, practices receive all compensation from patients, usually at the time of service. Patients then seek reimbursement from their insurance for any covered treatment or procedures. In many cases, practices aid patients with the reimbursement process, but overall, direct-pay models provide relief from the arduous patient collection chase on the part of the practice. Hesitation to change existing billing and collection processes is understandable. Practices may fear that switching to a direct-pay model would drive patients away. However, the existing evidence is promising. Many patients prefer this model because of the total price transparency required to make direct-pay work. When patients know the costs of care, they are more able to plan and budget for medical expenses, and they are also more likely to meet healthcare-related financial obligations. Medical providers are finding that they can see fewer patients and still make the same, or often more, money than with the traditional, multi-payer model. The good news is that if you have chosen Health iPASS as your aforementioned guide, you have also gained a convenient and user-friendly way to collect patient payments and streamline your check-in process, regardless of which payment model you decide to implement. Helping practices redefine and better manage their patient revenue cycle is our specialty, making Health iPASS the ideal partner for practices transitioning to a mixed or direct-pay model. With the proper guide and a carefully-charted new course that includes a flexible patient revenue cycle solution, it is possible to sustain your current payment model or implement a new one and ensure you are maintaining strong and steady operating income.